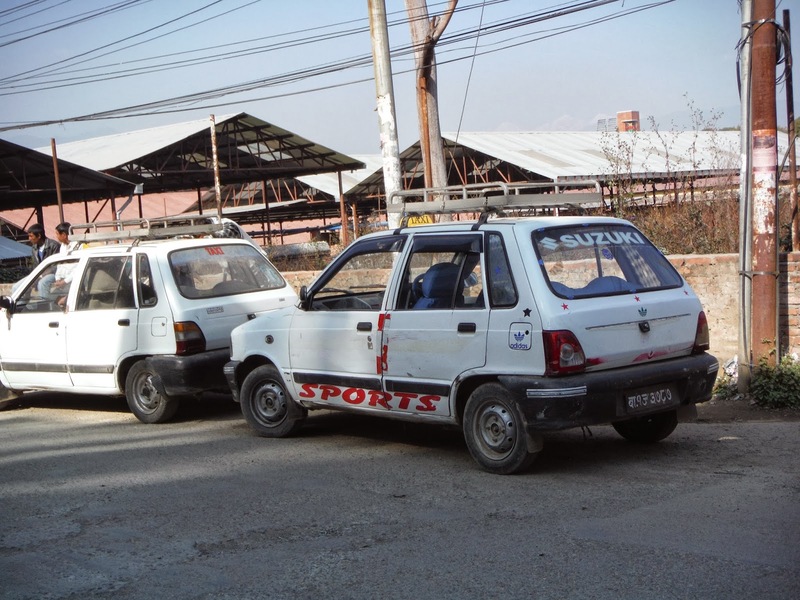 There are not nearly as many private cars on the roads in Nepal as there are in the UK. Cars are expensive to buy and then, once purchased, there is a very high tax to pay, virtually the same as the cost of the car. This means that many people do not consider a car is a worthwhile purchase. You need to be very comfortably off to afford your own car. In the cities taxis are plentiful and not very expensive, so these are used for many short journeys. Most taxis seem to be very small white cars, into which as many passengers as possible will pile, to share the cost. If there is a rule about number of people in a taxi, it is not adhered to! I have travelled several times in one of these small taxis along with four other passengers – a real squash but much cheaper than paying for two taxis! Microbuses, what we in UK would call minibuses, are the most common mode of travel for people in the cities. 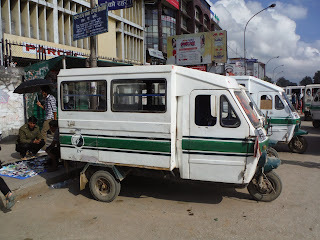 They are cheap, 15 rupees (10 pence) to travel about 4 miles into the city. However, again there are no rules about number of passengers and so, at busy times, many people are crammed in, the more fares the more money they make! I travelled in a microbus along with 35 other passengers one afternoon recently! Buses are also plentiful and cheap, so are well used, but mostly for longer distances, school buses or travelling around the countryside rather than for journeys in the cities. Long distance bus travel is served by large buses/coaches and tickets can be booked in advance. 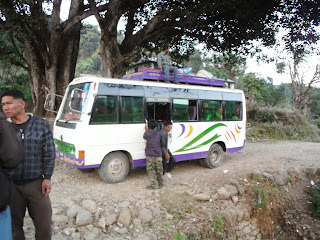 This type of travel is cheap; Pokhora to Kathmandu, about 7 hours travel cost 700 rupees – about £4.50, travelling in a tourist bus with allocated seats. 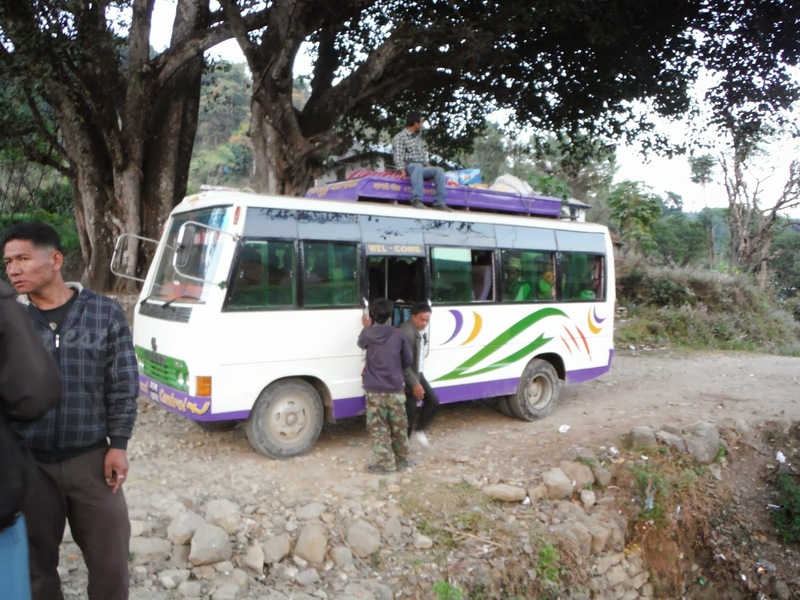 If you are Nepali, and travel on the regular long distance buses, the cost will be considerably less. As there are no trains in Nepal this is the way to get around the country for most people. For those who can afford it, there are regular internal flights to most parts of the country, which will cut travelling times to a small fraction of that of bus travel. Bus services to rural areas are fascinating. People pile onto the bus with huge bundles, bags and parcels. Sacks of rice, large packages and calor gas cylinders may be stacked in any available space. When the inside is full, people climb up the rear ladder onto the roof and travel there, along with other large luggage. 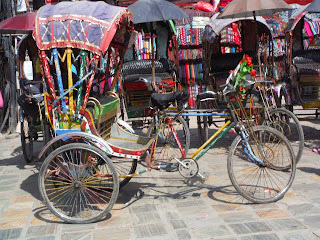 Tuk-tuks are to be found rumbling around the cities. They are as cheap but are a slow alternative to the microbuses. In construction they are like a milk float with a metal box for passengers to ride in. The ones I have used seem to have no suspension and, as a tall European, I have to be careful not to crash my head on the roof when the tuk-tuk goes over bumps and ruts in the road. The seats have no cushions either, so not a good option for anyone with a bad back. Motorbikes and scooters abound on the roads. 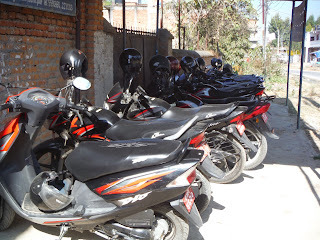 In Kathmandu there are special bike parks for them – but I have yet to see a car park here. The drivers have to wear a helmet, but there seems to be no such regulation for passengers. In many cases the motorbike is the means of family transport and frequently the wife and one or even two children are perched behind the driver. Bags of shopping may also be suspended from each side. 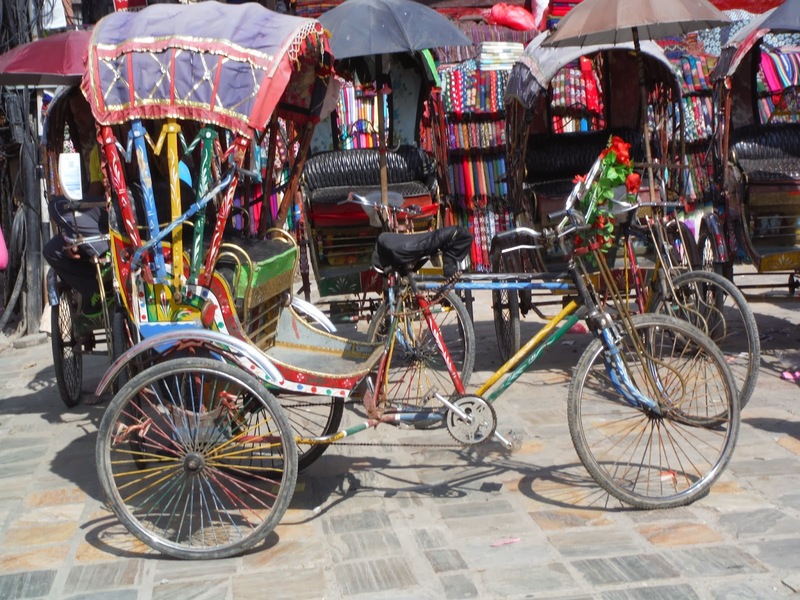 In Kathmandu city it is still possible to hire a rickshaw; a seat and sun shade for the passengers whilst the poor rickshaw driver has to pedal hard on the bicycle front part in order to propel them along. This is very much a service for the tourist and only found around the main tourist areas of the city. However many people still journey on foot, and see nothing wrong in walking an hour or more to get to work each day.